Our new and sustainable native garden is moving into the home stretch. The last swath of lawn is history. This didn’t happen over night. First to go was the sidewalk strip almost two years ago. It took some convincing around here as both my husband and younger son like the look of the lawn. While I too can appreciate the lush, green swath of suburban grass we grew up with, it’s not sustainable. 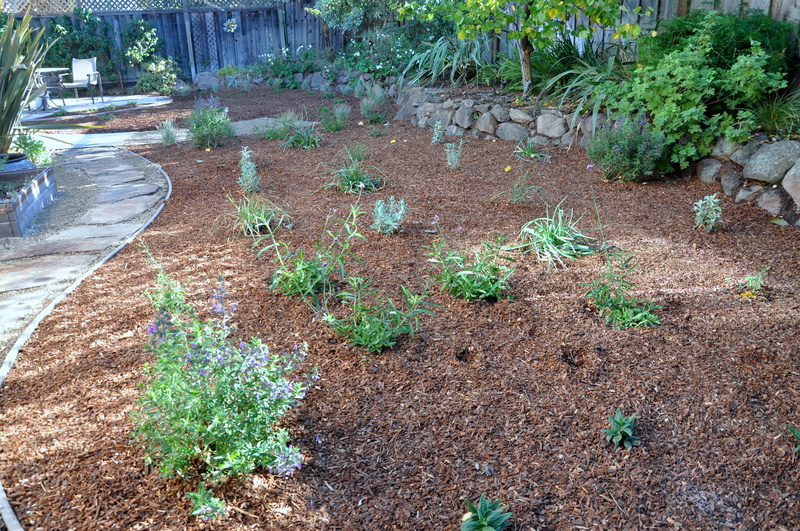 Four years of drought and mandatory water-rationing helped my case and the lawn is finally gone, replaced with California native plants that are more than happy to spend a summer without water. Last fall, Mike agreed to removing half of the lawn in our back yard. When the boys were young they played for hours on the grass. As teens, their interests lie elsewhere. So over the course of a few weeks, I gathered cardboard and leaves and gradually sheet mulched the area. It worked beautifully. By spring of 2015, the lawn was history, leaving behind a nice, healthy, organic swath of earth. Calls for further rationing this summer meant turning off the sprinkler system entirely, leaving a sad-looking patch of dead grass in front of the house. Now that all that grass is gone I feel liberated, but it’s come at a cost. I’ve put a friend out of a job. Nick took over the job of maintaining the lawn after Mr. Tran retired. Our sons went to school together. I hired Nick to build our little free library and I refer him to my clients for handyman jobs as well. Everything we do has a price. I saw my super-cool doctor again this week for my second post-op visit. She removed layer upon layer of bandages and gauze, the brace and finally the stitches. My foot looks other-worldly. The wound site is still tender but she’s pleased with the progress. They used cryogenic amniotic tissue to graft the damaged tendon. It’s supposed to reduce inflammation and speed healing while suppressing scaring and adhesions. Amazing! There’s a short video explaining the technology via the National Institute of Health I think it’s fascinating. 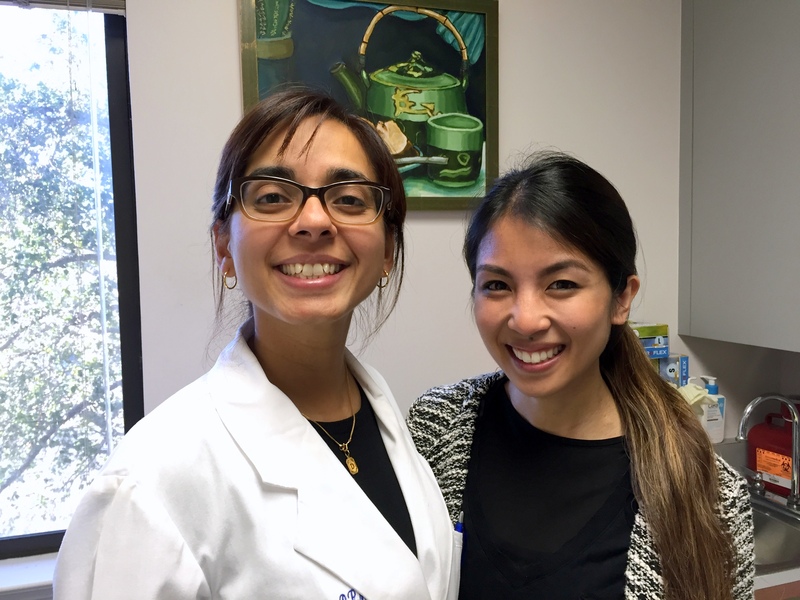 Dr. Sheth sets a high bar for patient care and bedside manner. I’m so fortunate to have her on my team. Two days before my foot surgery I had a skin biopsy on my arm. The dermatologist suspected squamous cell carcinoma. I got the call last week confirming the diagnosis and asking me to schedule surgery. It’s a thirty minute procedure, done by a skin surgeon in their office. They layer down till they get what they call the margins. With early diagnosis, there is a 95% cure rate. The scariest part of this for me is how quickly it appeared. I have skin checks twice a year because I’m at high risk for skin cancer. One day I was fine, and then a large, painful sore appeared on my upper arm. I was pretty sure I had some sort of insect bite. If you’ve been putting off getting something checked, please schedule with your medical provider today. Early diagnosis is key. I sat outside on the deck for about twenty minutes yesterday after the crew finished mulching. It was brisk but a welcome change of scenery. As you can see, I had company. These kitties bring me comfort every day. 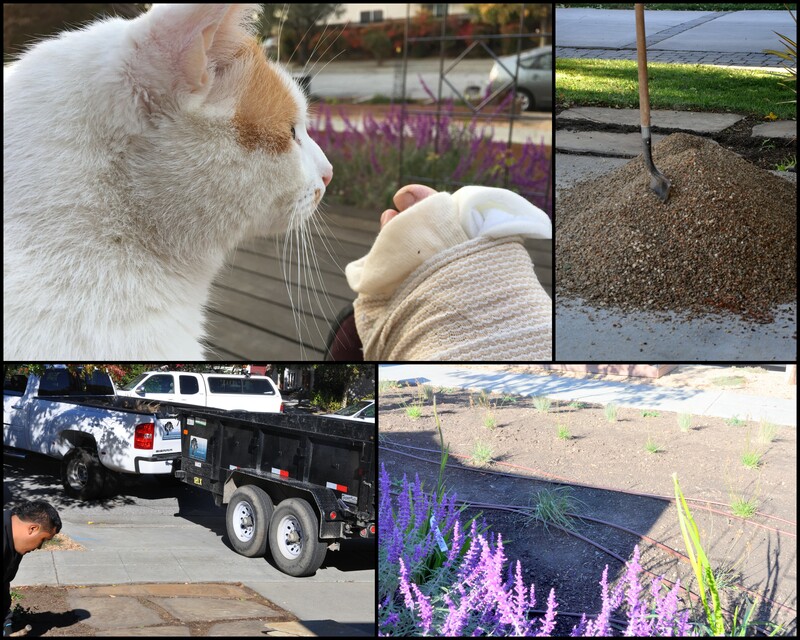 This entry was posted in Gardening and tagged Amniox, Bergez & Associates, california drought, california native plants, foot surgery, gardening during a drought, native planting, R J Landscape, replacing lawn, sheet mulching, skin cancer, squamous cell carcinoma. Bookmark the permalink. I am so glad you got it checked and am keeping positive thoughts for you. I’m one of those that can’t be in the sun either. You don’t need horror stories. You need peaceful, healing, healthy thoughts. The yard is coming along nicely and it’s wonderful that it’s maintenance free. I know what you mean about putting a friend out of work. Happy to see you have good healing company. They are so good for you. No more bad news allowed. 🙂 Huge hugs. Thank you, Marlene. I’ve often said that I’m a British Aisles gal living in semi-arid California. Fair skin, blue eyes and freckles add up to three times the skin cancer risk. Further, we didn’t have the superior sun screens when we were young. I’ve had some horrible sunburns in my youth. So glad to hear you are super happy with the foot process and progress. Doesn’t it make a wonderful difference when the health care provider is thorough and gentle and interested too. These are all essential ingredients for making a quick and happy recovery! The garden is going to look quite wonderful as it grows isn’t it – I am going to enjoy seeing seasonal reports and before and after photos of it. I used to mow my lawns with a handmower too – then I got a little man into do it for me and freed up hours of time! No lawns here though. Hopefully letting go your lawn man has meant he has lots more time to fill orders for little free libraries and the like. I’ve scheduled surgery for December 9th, so not too far out. They want it done within three months. That date will be two months from the time I found the bump. It is done by a skin surgeon in the doctor’s office, in and out in thirty minutes. I’m grateful to have health insurance to cover most of the cost. As for my podiatrist, yes, it makes all the difference in the world. I actually enjoy my visits! It is liberating not to have a lawn anymore! I’m feeling so good about it. Thanks for all your support. That’s really been nice for me. Your garden is looking amazing! Once it has settled and taken I’m sure it will be a healing environment in itself. 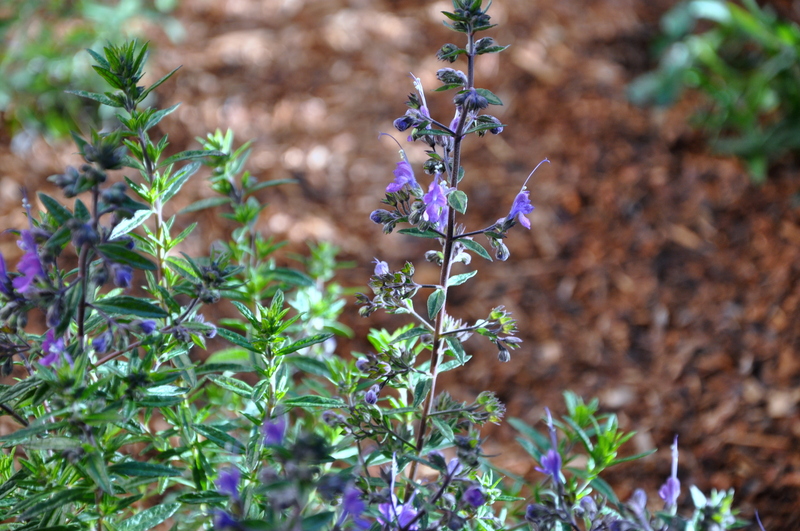 When the plants and land are as one and work in unison,can it be anything else? I’m so pleased your foot is mending well. I’m sure the other “issue” will also heal quickly. Those adorable kitties are being most excellent in helping you heal… nothing quite like a contented purr of a cat to harmonize ones own sense of well being. I realize in writing this comment that I have seen this as a post about healing. How wonderful! Thank you, Danella. These plants were a long time coming, but now that they are finally in, I’m a happy gardener.I love what you’ve said about the plants and land as one. Planting natives makes sense. I’ve learned so much in these past few years about planting sustainable. Thanks for your healing wishes and thoughtful reflections, Danella. Much love to you, too. Thank you, Wilma, for your kind words and good cheer. The garden makes me happy. The health issues will resolve. I’m glad you’re here. Thank you for your good wishes, Wilma. It is good to catch this early. I’ll be in for surgery December 9th and can put this behind me. The new plants are a joy. I feel so good about the new additions to the garden. Vibing positivity and so grateful for yours as you heal both yourself and your precious patch of Earth! Such lovely words, Cyndi. Thank you! I worked in a teaching hospital for 12 years so I second your suggestion about checkups for early detection. Having seen thousands of cases the one for sure thing you learn is that it is some much better to be on top of a problem than trying to catch up to something that has progressed pretty far down the road. Charlie, what a fascinating place to work. I’m sure you saw a lot in those 12 years. I’ve always tried to maintain good health by exercising, eating a vegetarian diet and getting regular checkups. Early detection saves lives in so many ways. Thanks for your supportive comments. Thank you, Cathy. I’m glad to hear your Dad is doing okay after his surgery. I will be glad to be rid of this, and have already scheduled an appointment for early December. That will be four weeks post-foot surgery, so I’m hoping I have more of my energy back by then. I’m sorry to hear that your husband has been dealing with bowel cancer, but relieved to know that he’s in remission. What a worry for all of you. Hurrah for early diagnosis on all fronts. Checkups are such a critical part of maintaining good health. So this was my process after reading the title of this post: Race past all the garden photos, stop at the photo of your surgeon – just how old is that child 🙂 – and quickly read about your post op visit. Phew! The foot is healing. YAY! Then I slowed down to read more carefully. I’m so glad you get your skin checks and while I know you’ll be fine, I’m sorry you have to add more one challenge to what has been an over-challenging past few months. If friendship and love were able to shore you up, know that you have it!! Finally …. the garden looks wonderful! A lovely place to heal. I agree – your surgeon, Alys, looks decidedly youthful! Helen, she radiates youthfulness, while at the same time reassuring with her knowledge and experience. What an amazing combination, eh? That is quite a combination! You make me smile, LB! Dr. Sheth assures me that she is 10 years out of medical school, but she could easily pass for 22. You would love her, Laurie. I feel that friendship and love and carry it with me every day. Thank you for that and for being here. I hope you’ll make it out to California one day so we can sit in my garden together. Wow. Lots going on. I love your sidewalk path. So lovely. We won’t be redoing our entire acre lot in mulch but a lot of it will be large , mulched beds with natives like you have. 4 years drought. How intense. And I’m from Texas. Hopefully El Nino will help. I’m shocked about your skin development. I have a bump on my chest that looks like the non – malignant cancer growth in had next to my eye removed. I better get on that. Gosh, so glad you detected it soon. How sobering! Thanks for catching us up. Hugs! Thank you, Leilani! Our lots in California are quite a bit smaller than in Texas. You’re a lucky woman to have an acre to work with. Our lot is about 6,000 sq feet with an 1,800 sq foot house. I know whatever you do will be beautiful and cleverly designed. You have that gift. Yes PLEASE go get that bump checked. Make sure they look at everything while you’re there, too. Often the backs of the legs, arms and neck are the worst because we just don’t/can’t see them. Wishing you all the best with the outcome. Your yard looks fabulous! So glad about the foot. As for the skin cancer, just keep checking, girl. In spite of skin checks, I’ve found every single one myself! Lisa, I’m really sorry to hear that you’ve had so many episodes of skin cancer. I’ve had two, but the first was on the back of my neck and wasn’t even on my radar. I now know better. Dawn, you always say the nicest things. I love that your take away from this post is wisdom. Thank you for that. As my foot continues to heal, I’m able to see a future of pain-free walks through the garden and hopefully nature hikes as well. The skin cancer surgery is scheduled for December 9th, so by Christmas I will be cancer free and hopefully walking around on both feet. That is my hope. Alys, thanks so much for updating us. Congratulations on the lawn re-do; you will save time, money and hopefully much aggravation. But yes, it all comes at a price. I too love the look of a green lawn, but in a dry climate it’s just not practical and often, not even possible. I am so glad you are in the care of a good doctor, AND that you caught the squamous cell cancer. My sister had it on her face just a few months ago but they caught hers in time too. It’s regrettable that one or two cancers seem to get all the hype, caution and donations, but some that are just as common and deadly (maybe more so) are often not mentioned by doctors. I have every risk factor for skin cancer, including siblings with melanoma and squamous cell, but no primary care doctor I’ve ever had seems worried about that, so I just self-refer for a skin cancer screening each year with a dermatologist. Enjoy the upcoming weekend! I’m sending you warm wishes for a speedy recovery. Thank you, Julia. I’m so happy with our updated garden. After months of staring at dead grass, drying mulch and putting up with the heat, it is WONDERFUL to have a garden filled with native plants, healthy mulch and an efficient drip system. The rains are coming too. I’m happy. I’m appalled to hear that your doctors do not alert you to regular skin checks. And you’re right, skin cancer is common, and increasingly worse with tanning beds and over-exposure to the sun. I’m glad they caught your sister’s cancer early and hope she’s made a full recovery. Keep on getting yours checked. I know you’re on top of it given your history and your family dynamics. I hope you’re enjoying your weekend. C. is home from college for the week so we’ve had some nice catch up time. It’s still in the mid-seventies here, but the nights are finally cooler. Best of luck with the next operation. Like you, a bit of shock but thank goodness you spotted it early. Anyway, I’m pleased that your foot is on the mend. Interesting to know the procedure. Thank you, Helen. I imagine given your northern exposure and damp climate that skin cancer is less prevalent. I read once that people with my coloring (fair and freckled) were made this way so that we could absorb more vitamin D in the far northern climates, since it is essential for good health. Then if you take someone with my coloring, and locate them in semi-arid California, you increase the risk of damage. Crazy! I too am pleased that my foot is on the mend and that the garden is looking it’s best. Thanks for being here. I’ve got the same general skin type as you and so am more at risk of skin cancer, though I don’t go to tanning studios or have sun holidays abroad. I think that is largely where people in Britain get their problems from. Cataracts are another – my mum has one as did my grandpa. So I guess there is a good chance I will, too. Thank you, Helen. When I was a teen, people were really into getting a tan. I now have friends my age who regret that. The sun is responsible for 90% of the aging you see on people’s skin according to my doctor. My fair-haired mother also had cataracts. Yet another thing to watch for. LOL, Kerry! Yes, Dr. Sheth looks considerably younger than her years OR she graduated medical school on an accelerated schedule. You would love her. Oh, wow, Alys! Lets start with the good news first – so wonderful to hear your foot is healing as it should. I’m impressed by the youthfulness of your doc. Either they’re getting younger or we’re getting older 😉 And your new front garden/lawn is truly just so wonderful. Very zen-like. Makes me want to pull out mine and be done with the maintenance. Thank you, Stacy. Each day I have a bit less pain and a bit more energy. I’ve promised myself that I’m going to be the world’s best patient so that I heal properly and completely. I suppose you and I are a *bit* older, but clearly Dr. Sheth has dipped her tow in the fountain of youth. She wears it well. As for removing your lawn, I say go for it. I feel positively liberated. Further, the natives will attract more beneficial insects and birds, another win for the environment. Your poor dad! I can only begin to imagine the damage from all those years on the open sea. I’m glad to hear that he always comes through with flying colors, and delighted, too, to hear that he’s into his nineties and doing well. Good genes. Thank you for all your well wishes. The surgery is about two weeks, so not long to wait. Thank you, Boomdee. I’m sorry to hear that you too have a concerning spot on your skin, but I’m glad you’re on it. I hope they can get you in right away. I was still pretty out of it when I got the news less than a week after the foot surgery, so I don’t know that it fully sunk in. I had one other skin cancer surgery many years ago, so at least I know what to expect. I’ll have it removed in a few weeks time, and hope to start the year with healthy skin and a healed foot. Meanwhile, as you say, C is home for the week from college so we’re all together. We might even get a bit of rain later this week. I’m hopeful. The new garden will love it and of course I will too. Sending huge well wishes your way, take care!